is an important business book. 30 Rockefeller Plaza—made famous now by the TV series 30 Rock. by the product and brand usage characteristics of these audiences. audience is then marketed to advertisers and their agencies. liked her as a person. banking, and finally packed it in permanently. Disney, we kept in touch, and I followed with pleasure her advancing career. program (Part Two: Marketing Inside the Company). succinctly put it, with synergy “1+1=3”. and then director, was set up to implement the synergy program. 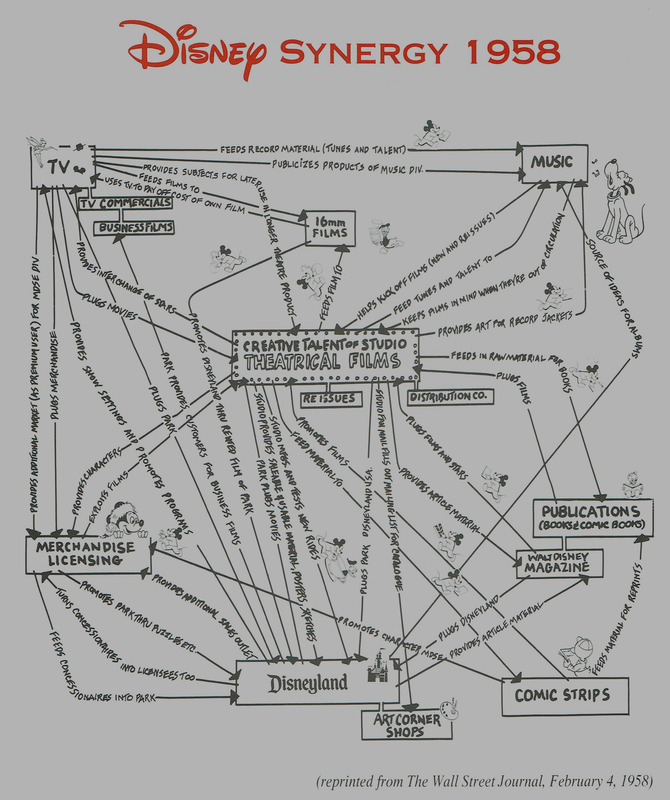 entertainment, and creative executives were in the synergy loop. growth in revenues and profits can be attributed to the synergy program. no longer afford to squander what economists call our “human capital”. Walt Disney was the first Hollywood executive to use synergy within a corporate structure as shown in this illustration from the Wall Street Journal in 1958! Reblogged this on The Synergy Expert.